Founder of Correo Real. She also coordinates the Symbolic Migration in northern Mexico. In the 1970's, when her children were young, Señora Rocío Treviño and her family moved to Saltillo, Coahuila, a town in northern Mexico. Every fall, thousands of butterflies would flood the skies for a few weeks in October. Everyone assumed the butterflies were invading insects. The children made a game to see how many they could hit and kill. As Senora Trevino remembers, her children held contests to see who could make the biggest pile! Much later, she came to realize that these were the same, famous monarch butterflies that migrate to central Mexico from across the eastern U.S. and Canada. Her town of Saltillo, she realized, lay along the migration route. The monarchs traveling through had come from as from as far away as Canada and were migrating another 400 miles to her south, to spend the winter in the mountains of Michoacan and Mexico. 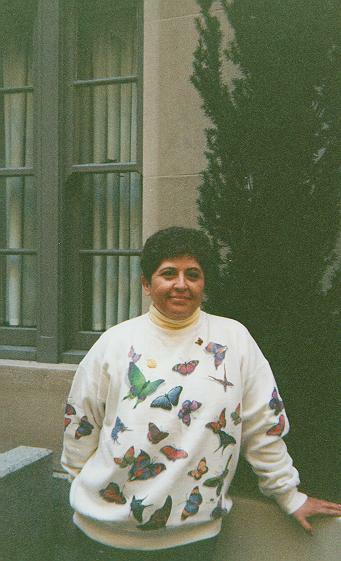 Señora Treviño became concerned that uninformed people, like her own children, needed to know the monarch's story. So began the "Correo Real" Monarch Education Project. With the help of school children across northern Mexico, Señora Treviño coordinates the tracking of the monarch migration. Because networked computers were rare when her program began, Senora Trevino collected these sightings the hard way--through mail, phone calls and sometimes by Fax. This is why she named the program "Correo Real," Spanish for "Royal Mail."